methods of removing broken pipes and studs. REPS Extractors work by pulling, rather than reaming, and are designed for strength, durability and easy handling. A set of REPS Extractors will save time, money and equipment in machine shops, manufacturing plants, industrial plants, rail and bus lines and countless other places where machine and equipment maintenance plays a key role in day-to-day operations. REPS Pipe and Stud Extractors do the job quickly and easily, an important factor when time is critical. 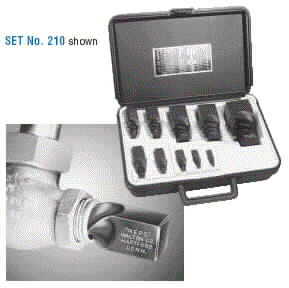 A complete set of ten extractors fits every size and class of pipe from 1/8" to 2". The same set of tools fits every stud and screw from 3/8" to 3-1/2". These extractors will save you many times their moderate cost. These standard extractors are for right-hand pipe and studs. Left Hand Thread Extractors are available. Have each size on hand by buying a standard set. Each set is furnished in a sturdy plastic case. EXT.REP3 3/8" 5/8" or 3/4"
EXT.REP 10 -- 7/8" or 1"
EXT.REP5 3/4" 1-1/8" or 1-1/4"
EXT.REP6 1" 1-1/2" or 1-3/4"
EXT.REP8 1-1/2" 2-1/4" or 2-1/2"
EXT.REP9 2" 3" or 3-1/2"